Contrary to claims that a Canada-EU trade deal won't increase health costs, federal government officials have studied the European Union's trade demands on drug patents and calculated a potential cost of $795 million-$1.95 billion annually. Confidential federal research on free-trade talks with Europe shows that giving the European Union just one part of what it wants on drug patents would cost Canadians up to $2 billion a year. The Department of Foreign Affairs and International Trade has always insisted it's a "myth" that the Canada-EU free trade deal would increase health costs. But in September, officials at Industry Canada and Health Canada combined forces to examine the cost of the European demand to implement a patent-term restoration system, The Canadian Press has learned. They found that based on past history of approval patterns, the EU proposal would add an average life of 2.66 years to a typical drug patent, and increase Canadian drug costs by between $795 million and $1.95 billion annually. The range of projections is large because government analysts have no way of knowing exactly what kind of drugs will be in line for patents in the future, and had to make some broad assumptions. The analysis also looked at the cost of a compromise that would see patent terms extended to cover the time between application for regulatory approval and market authorization. Such an option would likely add an average of 1.23 years to patents, and cost Canadians between $367 million and $903 million annually. A third option would just extend patents to cover off any delays beyond Health Canada's benchmark guidelines. It would extend patent terms by 18 days on average, and cost Canadians between $14.7 million and $36.2 million a year. Generally, the extra costs stem from patients having to rely on brand-name drugs longer than they do now, rather than turn to cheaper generic drugs that would be available sooner if patents were not extended. The costs would have to be covered by provincial drug plans, employee insurance plans and individuals who buy drugs. Ottawa has not yet formally responded to the EU demands on drug patents or announced its position on intellectual property. The EU and its many large brand-name drug producers say Canada's patent regime is too lax and not up to global standards. Negotiations on the topic are kicking into high gear this week in Brussels, but given the controversial nature of the talks, negotiators are expected to leave any final decision-making on drug patents to ministers later this fall. Adam Taylor, a spokesman for Trade Minister Ed Fast, would not comment directly on the bureaucrats' number-crunching. "Our government has always sought to strike a balance between promoting innovation and job creation and ensuring that Canadians continue to have access to the affordable drugs they need," Taylor said in an email, reiterating the government's standard message on the drug patent regime. "Our government will only sign an agreement if it is in the best interests of Canadians." Still, the fact that federal officials are costing out options for compromise suggests strongly that Ottawa is considering a move — despite vociferous opposition from many provincial governments, the generic drug industry and some health-care advocates. The Canadian generic drug industry has financed its own research that indicates the EU proposals would cost Canadians about $3 billion a year. 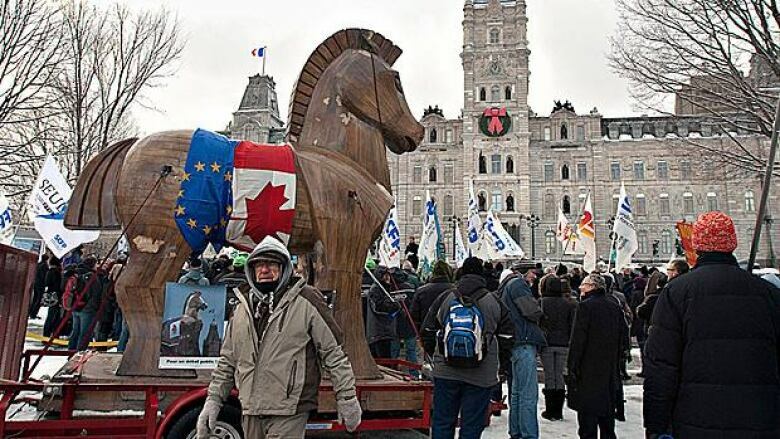 "These specific EU proposals are nothing more than an attempt at a cash grab on the backs of hard-working Canadians," Jim Keon, president of the Canadian Generic Pharmaceutical Association, said recently. "Extending market monopolies for brand-name drugs will not reduce trade barriers. It will, however, increase revenues for European-based drug companies at the expense of Canada's health-care system. It will also increase trade barriers for Canadian generic pharmaceutical manufacturers." Generic drugs typically cost less than half the price of their brand-name equivalents. Keon's arguments have the ear of several provinces wrestling with rising health-care costs. They have written the federal government demanding compensation if the trade deal drives up drug costs. But an equally vocal lobby led by the brand-name companies argues that Canada's intellectual property regime is not as strong as its competitors, and makes Canada a less attractive place to invest as a result. Brand-name drugs are one of Europe's top exports to Canada. "The notion of strengthening intellectual property as a way to drive investment and innovation faces criticism. But history tells us that it works," Russell Williams, president of Canada's Research-based Pharmaceutical Companies, said in a speech earlier this year. He argued that patent-term restoration is fair because it pressures bureaucrats to be more efficient in approving new drugs. "It simply ensures that if government regulatory and denial processes take longer than agreed, then the patent holder gets credit for the extra delay on the term of their patent." Patent-term restoration is just one of three EU demands on Canada in the realm of pharmaceuticals. Europe also wants brand-name companies to have more legal rights of appeal in case of unfavorable approval decisions. The EU also wants to increase data protection standards by two years. Patent-term restoration is widely considered to be the most important demand of the three. Canada's position on intellectual property and drug patents in the European free-trade agreement will serve as the basis of negotiation in broader free trade talks in the Trans-Pacific Partnership.